New Rochelle, NY, September 4, 2018–As people with cancer use social media to find and develop support systems, a new study looks at YouTube content to determine what kinds of videos elicit an empathetic response from viewers. Researchers have pinpointed several qualities among video diaries that garner the most support from commenters. 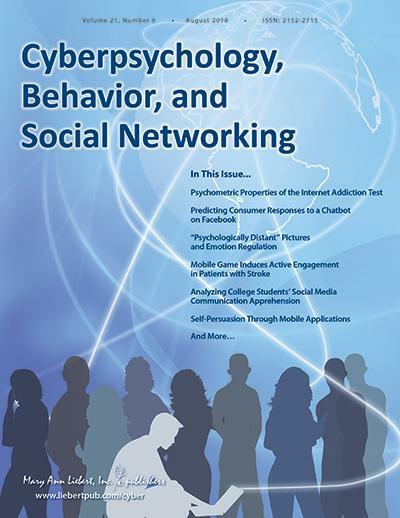 The study and how it can be applied in a clinical setting are discussed in Cyberpsychology, Behavior, and Social Networking a peer-reviewed journal from Mary Ann Liebert, Inc., publishers. Click here to read the full-text article free on the Cyberpsychology, Behavior, and Social Networking website through October 4, 2018. In the article entitled "Vlogging Cancer: Predictors of Support in YouTube Cancer Vlogs," coauthors Brent J. Hale, Amy L. Gonzalez, and Marie Richardson of Indiana University's Media School, completed a content analysis of 69 videos and 869 associated comments. Video blogs, known as vlogs, that centered the person with cancer as the protagonist who discusses their diagnostic experience, the problems they encountered, and their personal growth, yielded the most empathetic responses from viewers. This kind of support has already been linked to positive health and recovery outcomes. Interestingly, researchers found that pleas to get a checkup yielded fewer comments of support. "YouTube currently reaches more young adults in the U.S. than any cable network. Vlogging may provide a powerful channel to foster active engagement for those who, because of their illnesses, might lack the ability to engage outside of the home. " says Editor-in-Chief Brenda K. Wiederhold, PhD, MBA, BCB, BCN, Interactive Media Institute, San Diego, California and Virtual Reality Medical Institute, Brussels, Belgium.